Polyclonal antibody raised in rabbit against mouse MBD2 (methyl-CpG binding domain protein 2), using a recombinant protein. Whole cell extracts (40 μg) from HeLa cells, transfected with a TY1-tagged MBD2 (lane 2) or an untransfected negative control (lane 1) were analysed by western blot using the Diagenode antibody against MBD2 (Cat. No. 15410312) diluted 1:1,000 in TBS-Tween containing 5% skimmed milk. The position of the TY1-tagged MBD2 protein is indicated on the right; the marker (in kDa) is shown on the left. 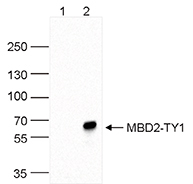 Diagenode strongly recommends using this:	MBD2 polyclonal antibody - Pioneer (Diagenode Cat# C15410312 Lot# A38-0020). Click here to copy to clipboard.